Your aim should be to teach the child about various tastes of food but not just dumping the food and seeing that her stomach is full. Do not ever force feed. Teach the child to learn to eat. If its not working right on the first day, it works right on the nth day. Important point to note is, IT WORKS RIGHT. Do not always focus on diverting her to TV channels, the park, birds, etc and feeding her as and when she opens her mouth by accident only to realize that she’s being tricked into eating. Be honest. Show her the food. Offer her whatever she is interested in and how much ever she takes in. She knows how much food her tummy can handle. A child can never overeat. So, do not keep diverting and putting in the food. There may be phases when child does not focus much on what she is eating. She gets carried away by all those toys or some other developmental milestone she may be experiencing and does not eat what is expected of you. Do not over stress the child. Do not force her to eat something you wish she had eaten. How much a child eats is all her wish. She gradually learns to eat what is required for herself. She may not be having much of the food for few on and off periods for which the parent may feel sad but leave it until there. She will get back on track and get better day by day. 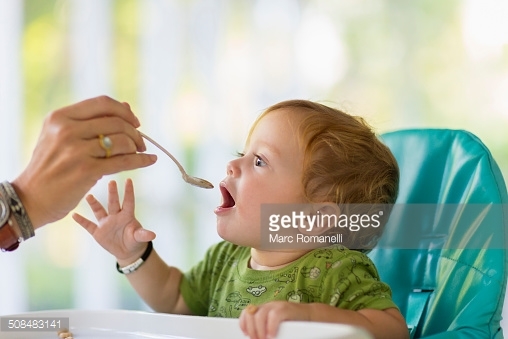 Let her put her fingers in food, let her handle the spoon, let her mess around a bit, all you should be doing is guiding her and directing her energy towards self feeding. She may not get it for the first time, but, as said earlier, she will perfect it some day.